Carrigan Umpherville is looking forward to making individual and team history during the 2019-20 hockey season. Umpherville, a member of Manitoba’s Cross Lake First Nation has verbally agreed to play next season with the Long Island University women’s team. It will be the debut season for the NCAA Division 1 squad, which is based in Brooklyn, N.Y. The team will compete in the New England Women’s Hockey Alliance. Umpherville had also attracted the interest from several Canadian universities, as well as NCAA Division III programs. But her heart is set on attending Long Island. Though she has verbally agreed to attend Long Island, Umpherville still needs to write her SAT next month. With a current over-all average of about 80 per cent, she’s confident she will be able to get accepted into the U.S. school. She’ll make her signing official when she attends the New York school. 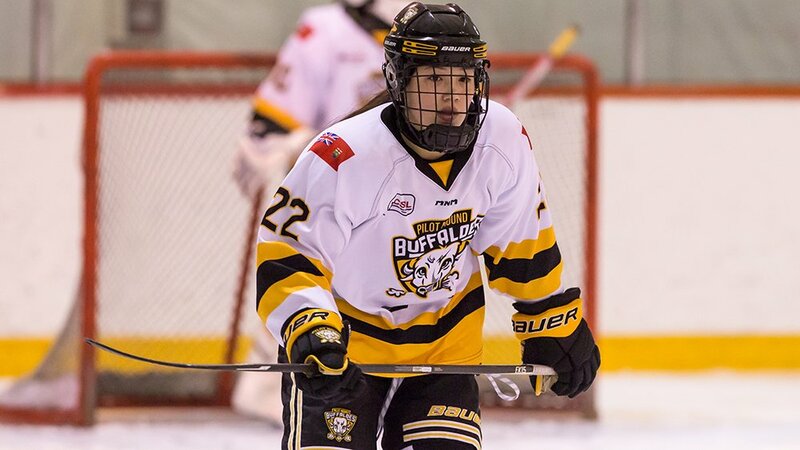 Umpherville is currently starring for Manitoba’s Pilot Mount Buffaloes, a girls’ Varsity team that competes in the Canadian School Sport Hockey League (CSSHL). She’s leading the Buffaloes in scoring having racked up 42 points (23 goals and 19 assists) in 48 matches, which includes league as well as tournament action. “She’s got an offensive touch that I haven’t seen in girls’ hockey,” said Pilot Mound head coach Harry Mahesh. Mahesh, a former pro, said he knew Umpherville was a special player when he first laid eyes on her. Pilot Mound is one of four clubs participating in the CSSHL’s female Varsity division. The Buffaloes are atop the league standings with an impressive 17-1-2 mark. Mahesh is confident Umpherville will end up capturing some individual hardware this season. A year ago, during Pilot Mound’s inaugural season in the female Varsity division, the club finished dead last in its league standings, winning just five out of its 25 contests. Mahesh said Umpherville has played a key role in the team’s turnaround. “She’s really sparked our team,” said Mahesh, who played six seasons of pro hockey, toiling for teams in Sweden as well as the Federal Hockey League and Southern Professional Hockey League. Mahesh also has plenty of other praise for the teen. “She’s kind of a low-maintenance player,” he said. “And she has a knack for the game. Mahesh added Umpherville is keen to suit up for the Long Island squad. The club’s roster is obviously not finalized yet but she is expected to be the first Indigenous athlete to suit up for the team. Mahesh is confident Umpherville will be able to handle the calibre of play in Division 1 hockey. Umpherville is hoping to study Kinesiology at Long Island. And she’s obviously also looking forward to suiting up for the university squad. “The coach has really convinced me it’s going to be a great program,” she said. Umpherville already has some experience living and playing in a major American city. Last year she was a member of the Boston Shamrocks, who compete in the Junior Women’s Hockey League. She wasn’t entirely thrilled with her time in Boston. “I wanted to experience the city but nobody ever made an effort to take us anywhere,” said Umpherville, adding adult supervision would have been required for her and teammates to see Boston’s sights. Umpherville said some of her friends from her First Nation who played at Pilot Mound last year convinced her to join them this season. The club now features four players from the Cross Lake First Nation. Umpherville is enjoying her one and only season at the school.